Alpine climbing in the Coast Mountains of British Columbia inevitably involves extended travel through wet weather. While attempting an enchainment of Mt. Waddington (13,186') and its neighboring peaks, I wanted a lightweight shell that was waterproof and breathable enough to wear during high-output exercise. Unlike my other shells, which fall short in at least one of these categories, the Muztag jacket exceeded my expectations. While climbing Mt. Waddington it rained, sleeted and snowed. Despite the onslaught of moisture, I stayed dry in the Muztag shell. To achieve breathability to match aerobic climbing, Rab uses the DVStorm membrane in the Muztag. DVStorm is eVent's newest membrane designed specifically for high-output aerobic activity. With a moisture vapor transition rate (MVTR) of 31,000 grams per square meter, this membrane is 20 percent more breathable than its predecessors and is rated to 10 meters of water in a column test. The Muztag's breathability stands out among other waterproof shells and exceeded my expectations while climbing on Mt. Waddington. While I'm accustomed to removing a jacket after several minutes of vigorous climbing, I rarely needed to shed it, which saved time and kept my base layers dry. I was skeptical of Rab's choice to eschew pit zips—from my experience with other shells, these are necessary for any aerobic activity—but the Muztag breathed well enough that I didn't feel the need for more ventilation unless the sun was beating down. Since the DVStorm membrane in the shell doesn't have a polyurethane coating, it's more susceptible to absorbing dirt and body oils than other shells. While frequent laundering restores the water repellency of many jackets, one has to be especially diligent about washing the Muztag. Dirt clogs the pores and limits the jacket's breathability. At twelve ounces (men's medium), the Muztag is on par with a packable, lightweight expedition shell like the Arc'teryx Alpha FL. It's not a seven ounce jacket that crams in your pocket and keeps you dry during a passing thunderstorm, but it's waterproof in a downpour. 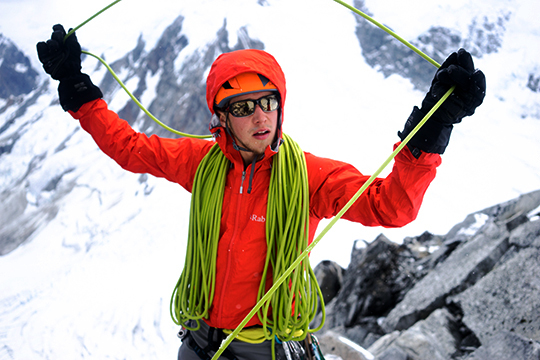 It also breathes and is durable: The jacket's 15-denier rip-stop nylon withstood abrasions while offwidth climbing. Ergonomically, this shell is designed specifically with climbing in mind. Rab intentionally extended the sleeves and waist to accommodate climbing motion. For sizing, Rab clothing runs a little large. I'm 5'11" with a slender chest and I fit a size small with room for layers and a light puffy underneath. Because the jacket has a slender cut, I'm able to keep my eyes on my feet when kicking crampons into ice. When I extend my arm for a high axe placement, the cuff stays securely around my wrist without tugging the jacket from under my harness. Two high external chest pockets are large enough to fit gloves and are easily accessed when wearing a harness. The hood on the Muztag cinches quickly around a bare head or helmet with a single elastic drawstring and stays in place. And the wired brim on the hood extends over the forehead enough to shed rain while staying out of peripheral view. Combined with a high front zipper, the hood kept the slush from running down my neck when rappelling over soggy bergschrunds. The water-repellent zippers never leaked, though the main zipper did snag on occasion. To fix the problem, I held the bottom of the jacket down with one hand, gripped the zipper's handle with the other and tugged up and down until it passed the snag. The Muztag is a versatile shell for climbers, breathable enough for high-output activity and durable enough to endure standard abrasion. While the Rab website advertises this shell as a summer-weight piece designed for "light climbing and mountain walking," it's robust enough for ice climbing. It worked great on Mt. Waddington and I've grown to trust it for extended climbs in wet mountain ranges. Pros: Highly breathable, storm proof, fit for climbing movement, simple and light. Cons: Front zipper snags on occasion.